Sometimes, words just aren't powerful enough. As we continue to see temperatures rise to record-breaking levels, climate change remains at the forefront of research, policy discussions, and private enterprises. However, discussions on the best solutions for climate change remain hampered by lingering debate over whether humanity’s influence on climate is fact or fiction. While there has long been scientific consensus that humanity is influencing our environment for the worse, especially through the increased emissions of greenhouse gases, public consensus has yet to be attained. In fact, a 2014 Gallup Poll revealed that about one in four Americans are solidly skeptical of climate change, believing that claims about it are exaggerated. For those who are convinced by the science behind climate change, the questions persists: what is the best way to communicate the science in a clear way so that skeptics can draw conclusions based on the best data? Some believe that the simplest way to accomplish this is through the use of visual aids. And, fortunately or not, there are many figures to choose from. 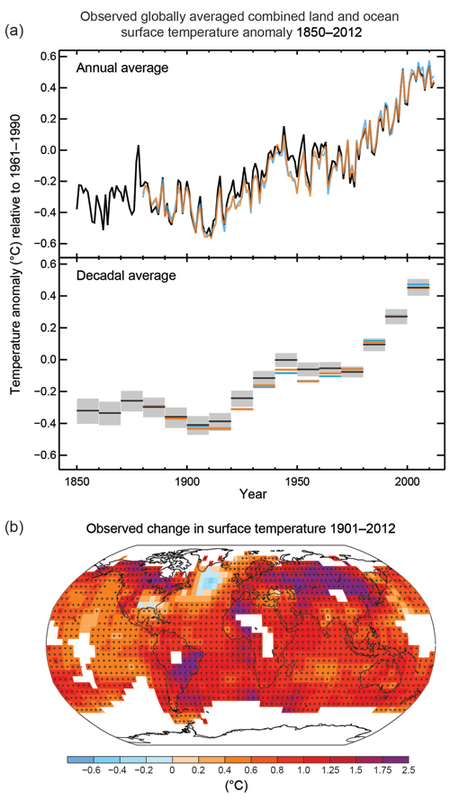 Let’s start with the elephant in the room: global temperatures. 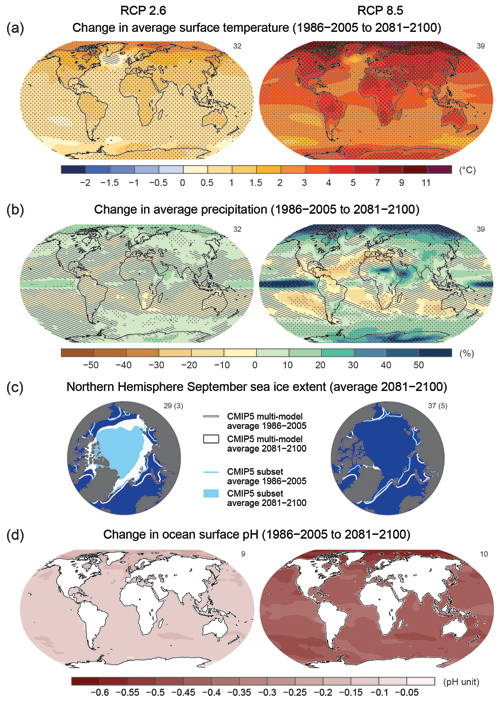 Scientists have observed an increase in global temperatures since the beginning of the 20th century. These increased temperatures are not in dispute. But what evidence is there that people are causing this warming? One indicator that the increasing temperature is linked to human activity is its correlation with our greenhouse gas emissions. While there are a number of greenhouse gases, perhaps the most famous is CO2, of the “carbon footprint” fame. Researchers have tracked CO2 emissions over time, and they, like the earth’s temperature, have experienced a dramatic increase after 1900. The majority of the emissions originate from our use of fossil fuels. And where do these emissions go? 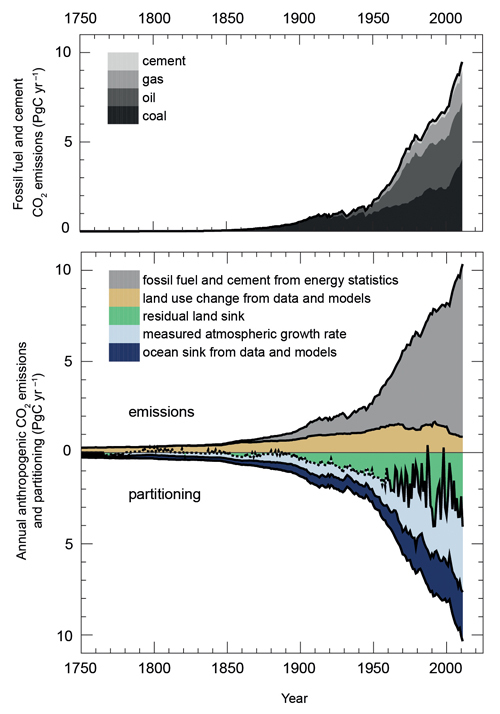 In fact, CO2 “partitions” into several places — the land, the ocean, and the atmosphere. While CO2’s greenhouse effect in the atmosphere is its most well known effect, the gas also changes the chemistry of the water it enters. CO2 reacts with water molecules to generate carbonic acid. 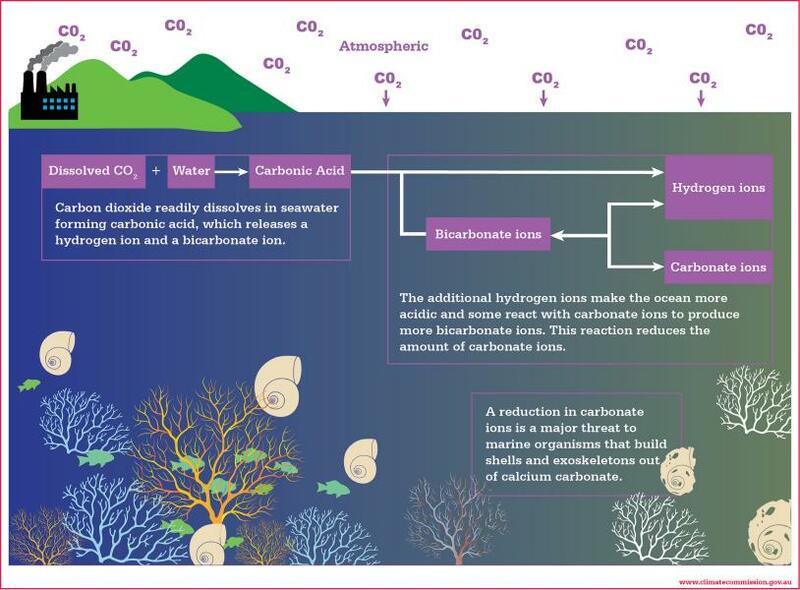 Not only does this acidify the ocean, negatively impacting many aquatic species, but this process also lowers the overall amount of carbonate ions in the water. This threatens shelled marine animals that require calcium carbonate, like coral. So, if the CO2 we are producing is harming our world today, is there evidence it will continue impacting the environment in the future? For quite a long time, actually. 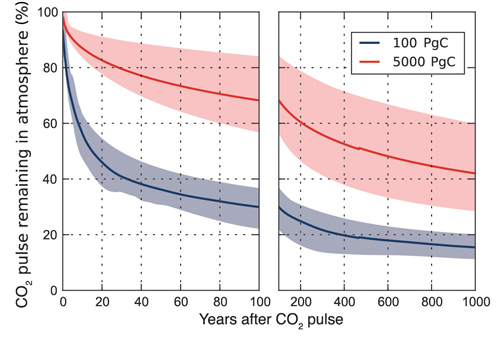 Once a large amount of CO2 is dumped, or “pulsed,” into the atmosphere, about 70 percent of it is still present after 100 years, and 40 percent remains even after 1,000 years. This is one reason why so many climate scientists urge immediate action. Researchers have made projections of what Earth will look like if we do not take action — and it’s not pretty. Then, in 100 years or so, our world may be unrecognizable. Let’s face facts, and, overwhelmingly, they support the reality of climate change. But that’s not to say that there can’t be legitimate discussion on how to combat it. New environmental regulations on the federal level often get pushback, but could we incentivize development of green technology in the private sector? Could we implement stronger environmental initiatives locally? There are even some out-of-the-box solutions we could consider. Rather than denying that there is a problem, we should be focusing our energy on determining the best solution. After all, the fate of the entire planet is at stake here. Are we really willing to risk it on a hunch that 97 percent of climate scientists are wrong?